Hi Everyone! Yes. It has been a while since you’ve heard from me. I am going to be honest with you, folks. I had NO idea how much time and work it takes to write a book. My hat is off to anyone who has ever completed the task. That being said, I’m chipping away at my book, and I’m pleased with my progress so far. Many of you want to know what’s up with Rachel Buffett’s case. It appears to be on hold. As of this writing, there is nothing on the court schedule for Rachel’s trial through the end of May, which is the farthest date available on the Orange County Courts search. I guess they are feeling pretty confident about proving Rachel’s innocence in court. She has not been charged with murder. She’s currently only facing around three years behind bars for lying to the police after the murders of Sam and Julie. This doesn’t mean the authorities don’t want to charge her with murder; they just don’t have a way to prove it. For now, Rachel remains out on bail. And hopefully doesn’t know where I live. Daniel Wozniak, though, is tucked away on death row in San Quentin State Prison for the murders of Sam Herr and Julie Kibuishi. His only change of locale comes from moving to a different cell. And that’s what happened last week. Prisoners have no say in where they’ll be housed. They can make requests, but if an inmate isn’t “content with his neighborhood,” he can’t asked to be moved without a good reason. In the past couple of months, a number of prisoners were released from the AC (the Adjustment Center), and back into main death row housing. Daniel got a bunch of new neighbors. Soon after, the noise level, and the number of “shenanigans,” increased a great deal. Nevertheless, to ask the guards to move to a more peaceful area in San Quentin State Prison is akin to asking an usher at the Super Bowl if you can be seated in a quiet spot in the arena. What’s an inmate to do? Well, Daniel had a lucky break – literally – when both the sink and the toilet in his cell became inoperable. For some reason, there was no water coming into Daniel’s cell at all. The California Department of Corrections has a policy that an inmate cannot be confined to a cell without access to water for an extended period of time, and the issue in Daniel’s cell wasn’t going to be a quick fix. The guards didn’t want to be running to get him bottles of water all the time, so the simplest solution (suggested by Daniel) was to move Daniel to another cell that had recently become vacant on the same tier. You wouldn’t think it would make much of a difference, but Daniel claims it’s actually a lot quieter and calmer on that end. It’s easier to study and read. Yes. It certainly was timely and beneficial for Daniel that his cell had plumbing issues just when he was contemplating a move to a new area. The details that go into changing prison cells are interesting. Things I’d never even consider worrying about could lead to an inmate being sent to “the hole.” This would mean a loss of many privileges such as telephone time and having visitors. It’s really important to obsessively clean your new “home” before you move in. Like many of you, I’m fascinated by this prison world. So when Daniel tells me what it’s like to move from cell to cell, I think it will make an interesting blog story. I’m still acutely aware of why Daniel is living in a cell in the first place. It could be said that he deserves much worse than where he is now. Sam Herr is dead. Julie Kibuishi is dead. Daniel Wozniak is alive. It is not fair. If Daniel had to share a cell with six other people, subsiding on only bread and water, he’d still be lucky he gets to wake up every morning. That being said, let’s return to prison life. We have all watched movies and TV shows where a prisoner has his cell searched by the guards. Uniformed men completely trash the inmate’s living space. They are looking for hidden contraband and they know inmates can be ingenious when it comes to stashing their stash. Weapons are the most dangerous finds. A piece of metal can be easily be sharpened into a knife. Illegal drugs and other contraband “somehow” manage to make their way behind bars as well. When inmates are aware that a search is about to take place, smuggled cell phones are slid far away from the cells and out onto the tier walkway. Toilets are repeatedly flushed. An institution-wide cell search can take days because of the thoroughness of the officers. Knowing this, Daniel has learned never to trust that a new cell is safe to move into. During his seven years of incarceration at the Orange County Jail, Daniel was obligated to change cells twenty times. He got very good at moving and cleaning. Daniel is clearly proud of his knowledge and experience of prison living. He laughs as his early days as a “new fish” at the OC Jail when he barely swept inside a new cell. That changed when he met a fellow inmate with a strange infected wound covering the better part of his arm (which required daily bandage changing by the jail nurse), and Daniel’s eyes were opened to what kind of germs could have been left over from past tenants. He jokes about “swabbing the deck” like a pirate because he doesn’t want to end up with a hook arm or a peg leg. Are we seeing a bit of a theme in this recent letter? Once arrangements had been made for Daniel to change cells, one of the guards gave him some boxes so he could pack up his belongings. The guard then walked a handcuffed Daniel over to his new digs and locked him inside. The guard got a rolling cart and brought Daniel’s boxes over to him. The boxes were put inside the cell. The door was locked. The handcuffs removed. The whole move took about thirty minutes and Daniel didn’t even need to find a friend with a pickup truck. The first order of business, before unpacking anything, is to make sure every square inch of the space gets washed, soaped, scrubbed and disinfected. This is a three-part process for Daniel. He uses the state-issued powder soap and water to get rid of the surface grime. He uses an anti-bacterial bar soap to deep clean the entire cell. He buys the soap himself. It’s usually Dial. He makes a concentrate with powdered laundry soap and water and goes over it all for a third time. Daniel buys the laundry soap as well. It’s usually Gain. He likes the smell. All the cleaning and scrubbing is done with a dedicated washcloth and steel wool. While cleaning, Daniel looks for any hidden surprises that may have been left by other tenants. This time around, he found an old sewing needle. He flushed it down the toilet. He did not touch the needle with his fingers. Ummm yeah. We are all imagining the dozens of ways that needle could have been a petri dish of horror. When the cell had been scrubbed cleaned and combed over, finally Daniel could move in and set up his new place. When he moved into his previous cell, Daniel found that the inmate before him had hung laundry lines across the cell and attached “netting” from the lines. This created some extra storage and a place to dry clothes that had been washed in the sink (with the Gain). Side note: The “lines” are usually made out of string from old boxers. Sometime knitting wool is used. Inmates who take arts and crafts often have different colored wool available, but that needs to be washed first, or you could end up with a colored stripe across all your clothes. Daniel looped his line through the bed frame and tied it. Then he gave it a tug to test its stability. It easily came apart. But it wasn’t the line that gave way – it was the bed. A loose piece of “cleverly camouflaged” metal had separated from the top of the bed frame, displaying its sharp and pointy edge. This was not going to flush down the toilet. Having such an item found in your cell is a very bad thing. But you also do not want to take it directly to a guard. Looking like a snitch is not the best way to make a good impression with the new neighbors. Well, an inmate could take that shank and place it in a “You Save ‘Em” interdepartmental mail envelope. He could address it to an officer, add an anonymous note of explanation and then casually drop it in with everything else during mail call, so the sender’s identity could remain unknown. Yes, an inmate, who doesn’t want to be identified, could use that tactic to get rid of dangerous contraband found in his cell. That was the end of Daniel’s new cell being the prison version of Mary Poppins’ bag, and no more surprises turned up. Daniel went to bed. The next morning, he woke up to the announcement of “mandatory yard” call. All inmates know yard time is only mandatory on institution-wide search days. Daniel, like all the other inmates on his tier, would be handcuffed with zip ties (for passing through a metal detector) and escorted to the yard until the search was finished. He didn’t get back in his cell until 9 pm, but at least he knew he wasn’t about to end up in the AC because of the former tenant’s bed-knife. It does give you pause to think about one of those fine death row fellows having a sharp weapon in his grasp. It’s no wonder the guards always cuff the prisoners before opening the door to their cells. My name is Daniel Wozniak and if you’re reading this blog, then you obviously know a great deal about me already. However, it’s been brought to my attention that there are still some curious minds out there inquiring about my day to day life behind bars since being sentenced six months ago. I understand that for the majority of readers out there, many of you think me to be a heartless, uncaring sociopathic monster who have reserved feelings for not giving a damn about anything concerning my life (other than how soon you wish for it to end). I’m not trying to, nor do I feel I can, take away the pain and hurt I’ve caused you to feel and all I can offer to you is a sincere apology for my actions. I know it will not do much (if anything) to ease the hatred you have for me, but it truly is all I can do at this stage. The truth is there are no words I can say, or actions that I can perform that will change how you feel, and I’m not trying to rob you of those feelings because I know you need them to help you cope and deal with the pain you’re experiencing. This letter is not my way of trying to justify my past because nothing on Earth can erase what’s been done. This is merely a response to certain individuals who for some reason or another are curious about life in prison in general. With the overflow of inquiries my friend (the author of this blog) is receiving, I thought writing this might be a way to help answer those questions being regularly asked. I’ve been given the death penalty and not a day goes by that I don’t feel all the painful thoughts and angry wishes directed my way by so many people. I know in what some of you would consider to be a perfect world, I would have already been put to death, but sadly that’s not the reality of the present. So what options do I have? I could sit around all day in a small cage doing absolutely nothing but watching the clock hands tick on by… OR… I could actually try to do something with the time I do have left to make SOME form of a positive difference around me. The majority of my day is spent in the confines of a cell measuring roughly 11′ x 4.5‘ (about 50 sq. feet). I live somewhat akin to a new-age monk. My cell consists of a bed, a toilet, a sink and 2 storage shelves – nothing else. The walls are bare and painted taupe in color; and my cell front consists of an open, metal bar door through which to enter and exit (as well as listen to about 500 other inmates housed around me in this section of Death Row). My only means of seeing anything in the outside world is by the use of a TV or radio. I also get access to the telephone a couple times during the week to which I’ll get timed fifteen minute calls. I’ll mostly reach out to my blog-writer friend who will keep me posted on current events, and will also touch base with family, other friends and lawyers. My day starts each morning at around 5 AM, when I wake up and do my daily prayer/study and meditation that I’ve done since being at County. Breakfast arrives between 6-7 AM to our cells on trays (none of us walk to a typical “chow-hall”). The trays are then collected about thirty minutes later and then program within the facility begins. Depending on the day of the week I’m either going to yard or going to class. San Quentin has seven recreational yards for this section of Death Row. 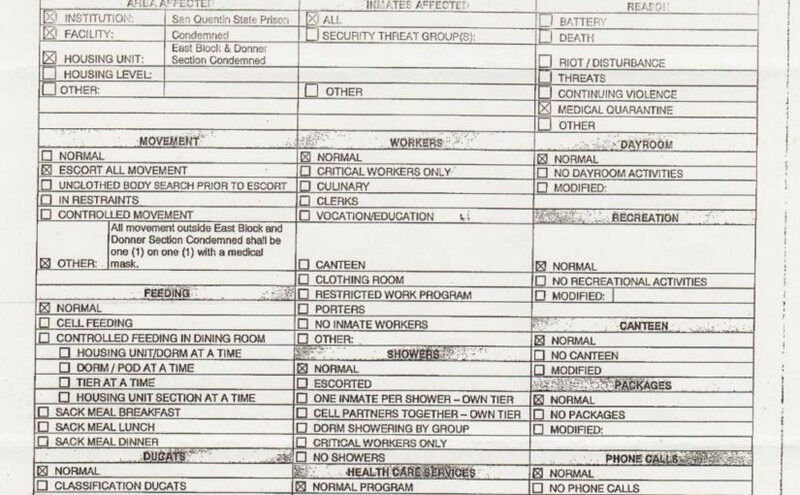 I’m placed on Yard #6 (which has roughly 50 – 100 other inmates classified to be out there with me). All the yards have concrete floor (no grass) and are separated from one another by a gap and chain-link fence. Each yard has a couple stainless-steel-top tables with attached seats, a basketball hoop, a set of dip bars, push up bars and pull up bars (and surprisingly a punching bag). The yard here is not like most other prisons which are generally racially segregated and for the most part everyone integrates quite well with one another. (We haven’t had a violent incident on our yard for the last 8 years now). Some inmates will play dominos, others will play cards or chess, others will work out and/or lead routines and some guys will just walk laps talking with another inmate as they walk. On other days, I attend classes ranging in subject matter. There are several programs made available, but I personally try to focus my field of study to those educational and therapeutic in nature. (Critical Thinking, Nutrition and Meditation, Yoga, etc.). It’s helped me find whatever meaning still remains in this life and with the knowledge under my belt I feel I can pass it on to others. That’s what a great deal of my time is centered on: helping others find meaning and purpose in their own lives. I know some of you categorize “criminals” as outcasts who don’t deserve another chance at life, but that’s where some others vary in their opinions (including myself). In the many years of my incarceration, I’ve encountered individuals who have given up on themselves to the point of not even wanting to continue living. I guess a part of me feels that if I can help them find that “meaning” that is seriously lacking in their lives, that I can justify my continued existence on this planet while awaiting my execution. Again, I want to voice this is not ME saying I shouldn’t be here – but there are (and have been) so many people given this sentence who truthfully do not deserve it legally. Not to mention the countless others who have already died unjustly here of natural causes; people who technically should never have been here in the first place. Spirituality also plays a crucial role in my life, as well as in the lives of other inmates at San Quentin. The prison offers several religious services (Catholic, Protestant, Judaism, Islam, Buddhist, Jehovah’s Witnesses, Mormon Latter-Day Saints and Native American Indian Tribal Councils). Due to the large number of inmates and a limited number of seats in the chapel area, sometimes you only get called out for service once a month. The television, however, provides an excellent array of broadcast services that you can tune into everyday, which is very nice. I’m currently also enrolled in a couple of Bible Colleges that I do via correspondence through the mail in addition to keeping in contact with various chaplains I’ve met over the years and still keep in touch with. The yard also provides an excellent means in which to learn, minister, teach and study with so many interested individuals from so many different backgrounds. Everyone comes together and shares their faith and testimonies of how their “path” has brought them some form of inner peace and it reassures fellow believers that faith is a powerful tool which can save and improve so many lives in various ways. I never thought I’d ever see the day where so many people from different religions and cultures aren’t as hostile and dominant in defending their religion, but rather share, add to and grow the unity of everyone around. There’s so much to learn! The final thing to mention is handcuffs. Every time you leave your cell for ANY kind of movement, you are placed in handcuffs. You are then either escorted to wherever your destination is with a Correctional Officer escorting you the whole way or you walk alone to said destination, cuffed with your hands behind you back. You’re even handcuffed when going to the shower. It’s a shared community shower stall (that’s twice the size of your cell) and you get showers every other day. However, most everyone here has ways to shower creatively in their cells so we can shower every day, anytime we want. After showers, the final action of the day before final lockdown is mail pickup and drop-off. This occurs at around 6:30 – 7:00 PM, Monday – Friday. The C.O. will hand us the mail we receive, then pick up our outgoing mail. Next he will apply a secondary lock on the cell door for added security each evening. (This is called “dropping the bar”). From 8:OO PM – 7:00 AM, everyone is locked inside and there is no movement ANYWHERE within the building and it’s “lights out.” Then the cycle repeats each and every day, very much like the film, Groundhog Day. I hope this helps answer the questions some of you have been asking and that you all have a closer look into the prison that has now become my life. I wish you all well and hope this ‘view into prison’ helps answer your inquiries. Have a nice day. In California, a lot more effort is required to visit a prisoner who is on death row versus visiting someone in a county jail. 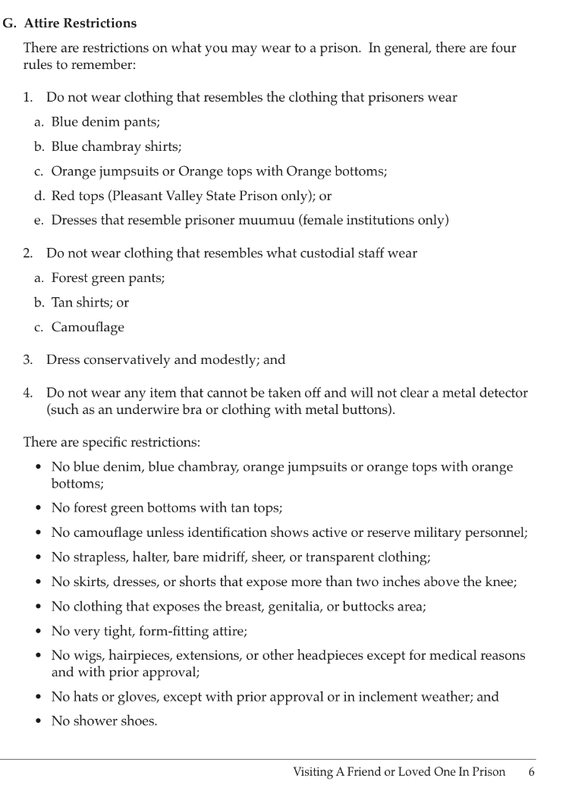 When Daniel Wozniak was in the Orange County Jail, there were rules and regulations that had to be followed to visit. Daniel had to put me on his “visitors list.” During the visit, I needed to put my possessions in a locker, go through a basic metal detector, etc. My visits with Daniel at County were non-contact visits, but the contact-visit people went through the exact same process I did. San Quentin State Prison is a completely different animal. Just north of San Francisco, San Quentin is the oldest prison in California (opened in 1852), and it’s the only one to house a death row for men. Prison is much more intimidating than jail, and there are so many steps necessary to visit an inmate. Long before I could actually visit Daniel at his new home, I had to be approved by the prison. 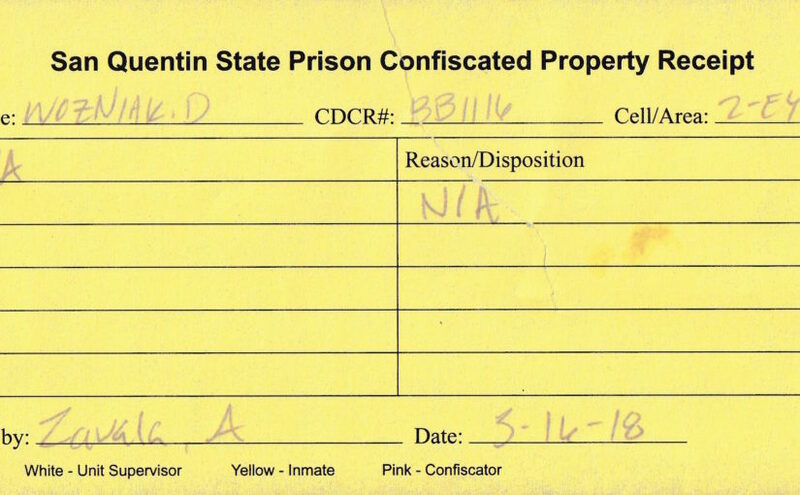 The inmate needs to request a visiting form, and then he mails it to the visitor. Daniel sent me the form, I filled it out, and mailed it to the sergeant in charge of visiting. After about a month (the normal waiting period), Daniel was informed I’d gotten the A-OK, and it was his job to pass that information on to me. Once a visitor is approved, an appointment needs to be made. In the OC Jail, visits were granted on a first come, first served basis. On visiting days, an inmate was allowed only one visiting session a day. I often saw people being turned away by the deputies because someone else had beaten them to the punch. There was no fear of that happening at San Quentin. I needed to make an appointment. Normally appointments are done by telephone, with assigned days and times to call and reserve for the upcoming weekend. However, since I live in Orange County, which is a six to eight-hour drive from San Quentin, I wanted to set up an appointment farther in advance. For that, the visitor can make a visiting request by mail, if it is done at least one month ahead. Include a self-addressed stamped envelope if you’d like a direct reply, otherwise the sergeant will inform the inmate that an appointment has been scheduled. I first learned about San Quentin being on lockdown a couple of weeks ago because I was added to a visitor’s mailing list when my request was accepted. I was approved for extended visits on both days I’d requested. I was scheduled from 9 am – 2 pm, on Feb 10th and 11th. I booked a hotel in the city of San Rafael, which is about five miles from San Quentin State Prison. No surprise – the hotel did not list San Quentin in the local attractions section on its website. “We have a pool, a weight room, and we’re just a hop, skip and a jump from California’s death row.” Conveniently, I have some very close friends who live in the San Francisco area, so I made plans for my non-death row time as well. At least the restrictions about color were limited to clothing and not hair, because I was sporting an array of all the Barbie furniture hues at that time. Phew! For this first visit, I decided to drive from Orange County instead of flying. I wanted to have control over as much as possible. I might not be allowed to wear chambray blue or shower shoes, but I can make sure I don’t have to deal with a cancelled flight or lost luggage, and I wouldn’t have to worry about getting a cab or an Uber to get me to the prison on time. Obviously, I had some concerns that I would somehow, some way, mess things up. I didn’t want to be denied the visit after all this preparation. I was also really looking forward to seeing Daniel again, and I know he felt the same way about seeing me. This was going to be our first unrecorded conversation. I figured I’d drive up a day early so I could do a practice run and make sure I would be able to find San Quentin from my hotel. Anyone who knows me would not put it past me to get lost, even though the prison was less than six miles away. Daniel told me his mom got all twisted around when she’d visited him the first time. He couldn’t understand how that was possible, since the prison, which occupies 275 acres on Point San Quentin, juts right out into North San Francisco Bay. “How can you miss the place?” he asked me on the telephone. There were little blue and yellow and white beach cottages along the road and I was reminded of trips to Catalina Island. I was not at my destination. I couldn’t even see the prison from that spot. I ended up on E. Sir Frances Drake Blvd, where I, too, felt like I was attempting to circumnavigate a large land mass. I finally found a small road that went downhill into the prison. Admittedly, I was pretty sure this wasn’t the main entrance, but at that point it was the only entrance I could see. The guard, who stood in front of a guard shack to my right, opened the gate for me. I couldn’t exactly tell if he wanted me to stop or not, but I figured I’d better ere on the side of safety. I needed directions anyway, so I rolled down my passenger side window and asked if this was the correct entrance for visiting. “Who are you visiting?” He wasn’t hiding his irritation. I pointed to an open area just inside the gate. “Can I just pull in there and flip around?” My car is not small and I am not tall. At this point, there were other vehicles lined up behind me, including a UPS truck. “OK. Sorry.” I proceeded to do a fifteen-point turn to get my car heading back to Frances Drake. I ended up driving kind of alongside the prison looking for another entrance road. Somehow, I ended up missing the surprisingly small sign marking the turn I needed to take. That’s when I got stuck driving across the Richmond-San Rafael Bridge. The sky was clear and blue. It had rained the day before, but now the sun was out. It was a lovely scenic view… That’s what I told myself to keep from feeling like an idiot. It wasn’t until I headed back across the bridge that I finally got a full view of the prison in all its glory. The place is huge and menacing. Photographs don’t do it justice. I can’t imagine being driven through its gates and knowing it would be your home for the rest of your life. When I got back on the prison side of the bridge, the sign to turn was more clearly marked (or I knew to where to look this time). 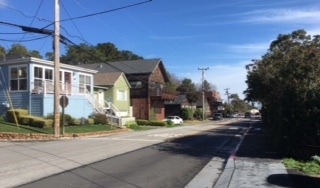 I drove slowly through this residential area for a couple of blocks. I knew the property around there had to be super expensive. Waterfront views in the San Francisco area to not go cheap. A small three-bedroom house can easily fetch over a million dollars according to local real estate websites. I finally got to the very end of the cul-de-sac, and there was the prison, The largest piece of real estate in the neighborhood. 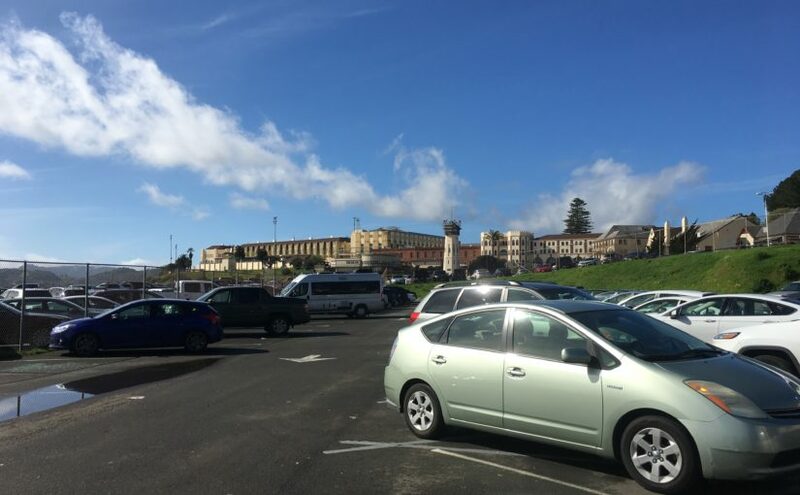 In 2009, there was even a proposal that the state should sell San Quentin and re-build the prison on property that didn’t have an ocean view. That didn’t happen. This wasn’t an official visiting day, but there were still a number of cars in the visitor parking lot. It was the first of three large lots, but the only one you could enter without going through a guarded and gated checkpoint first. The white wooden guard shack was weathered, but no less intimidating. I carefully drove down the steep narrow road entering the lot and parked my car. I walked halfway back up the road and looked at the wooden building that had a small “visitor entrance” sign over the door, that was probably hung up in 1972, and not touched since. The place was grungy and deserted. A puddle of water on the cement floor told me the roof probably leaked during the most recent storms. I didn’t want to imagine an alternative scenario that would cause a floor puddle. On the right side of the narrow interior was a wall of beat up blue metal lockers. Who knew the visiting area at the Orange County Jail could look so clean and modern by comparison? County had plenty of plastic molded chairs for the waiting visitors. San Quentin had a couple of old benches. I spent some time looking around and snapping pictures of the numerous informational bulletins hung all over the wall. 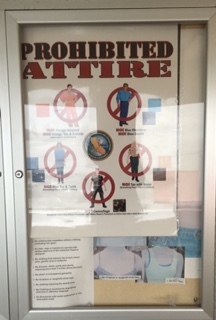 Many of the signs re-iterated the clothing and other visitor rules I’d seen online. If the guards deem your clothing to be unacceptable, you can borrow some used clothing they have available for such a circumstance. It reminded me of how my son’s middle school has a similar policy when kids forget their PE clothes. The loaner PE clothes are pink. There was a locked door heading into an office check point and metal detector. I figured I had the gist of the place, and I was glad I’d made this practice excursion. It made me feel less stressed about coming back the next morning. I parked my car alongside the road next to a one-hour parking sign. I had to check it out. 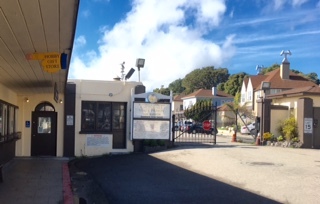 A San Quentin gift store was the kind of thing that would have grabbed my attention long before meeting Daniel. Unfortunately, the store was closed, but I could see inside the front window. The store was a place to sell crafts and art work made by the inmates in classes. (Daniel later told me there is a long waiting list to get into those classes. They are very popular). I took a couple more pictures before a guard came around from the gate and suspiciously asked me if I needed help. Once again, I explained that I was taking a test run for my visit the next day. I guess I could have said I’m a writer working on a book. That’s true, too. I decided it was time to get out of there for now. I was going to be spending enough time around the place that weekend. I took a deep breath of fresh air and headed back to the hotel to get some writing done. Along the way, I stopped at the Redwood Café and got a grilled cheese sandwich and a café latte to go. Daniel has been on San Quentin’s death row for a couple of months now and he’s settling in quite nicely. It will probably be at least a year or so before there is any action regarding his appeal, which means he won’t be going anywhere for a while. San Quentin’s condemned unit is a well-run machine. Daniel’s life is much more scheduled now. He’s taking classes regularly, he attends various religious services, and he goes to dental appointments. Daniel was recently assigned to yard group six, and can go outside every day. He assured me that it is a very safe group, and that’s why he requested it specifically. The inmates in this group aren’t in gangs (or have dropped out of gang life). Yard group six hasn’t had a violent incident in eight years. 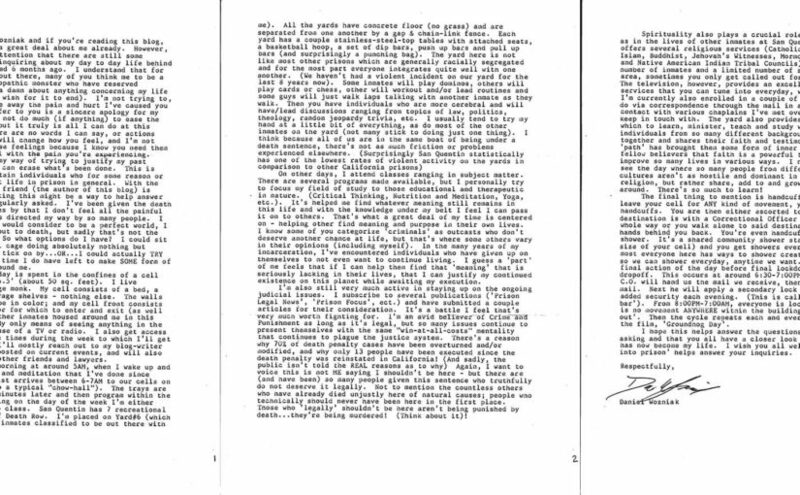 Also, Daniel already had a buddy in that group he met when they were both locked up in Orange County. 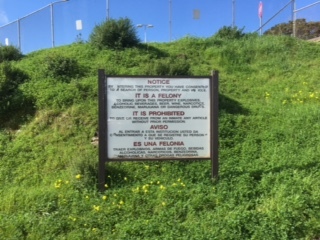 The condemned unit of San Quentin has a fair and organized yard use system. There are six large outdoor areas on one side of the prison and one smaller outdoor area on another. The inmate groups rotate from day to day, meaning each group will be in the smaller yard once a week. On Daniel’s first day out with the group, they were assigned to the small yard, and even then, he was still impressed with the size. I was looking forward to hearing all about Daniel’s first outing with his new group. Did he have fun? Were the other inmates nice? Is there a tetherball court? I may be a little too used to questioning my kids after their first day of school. But the first thing Daniel told me was how he had come close to getting his first major write-up since being incarcerated. Uh oh. My mind immediately went on a tangent; graphic scenes from episodes of Oz were playing in my head. Did another inmate come at him with a shiv? What’s a person supposed to do then? You have to defend yourself if another person attacks you with a sharpened ring pop. Maybe he mouthed off to a guard? That didn’t seem like Daniel at all, but if he’d made a joke that wasn’t taken the right way, he could be heading to solitary confinement for the next five years. A pocket bird. I didn’t see that one coming. Daniel was an amateur magician in his teens, so maybe he was planning to practice tricks in his cell? Daniel had noticed a small bird, possibly a sparrow, walking around amongst the thirty or so inmates who had come out for yard. Daniel thought the bird looked injured, and the little guy wasn’t flying at all. He suspected this was a baby that had fallen out of a nearby nest. Inmates get a sack lunch each day they can bring out to the yard, so Daniel tried to offer the bird a small piece of bread from his sandwich. The little fellow didn’t immediately trust Daniel’s offering. For the next thirty minutes, Daniel calmly followed the bird around the yard’s running track, repeatedly putting out his hand to offer bread. I asked him if he tried throwing some bread to the bird to gain its trust. He laughed and admitted that was probably a good idea and wished he’d thought of it. Nonetheless, “Birdie” finally came around (or was just tired of all that walking), and took some bread from Daniel’s hand. By the end of yard time, this little bird was standing on Daniel’s index finger and eating out of the palm of his hand. At that point, Daniel decided “Birdie” needed a warm safe place to recuperate for a while. He figured he could make a comfy little bed on the empty shelf in his cell. 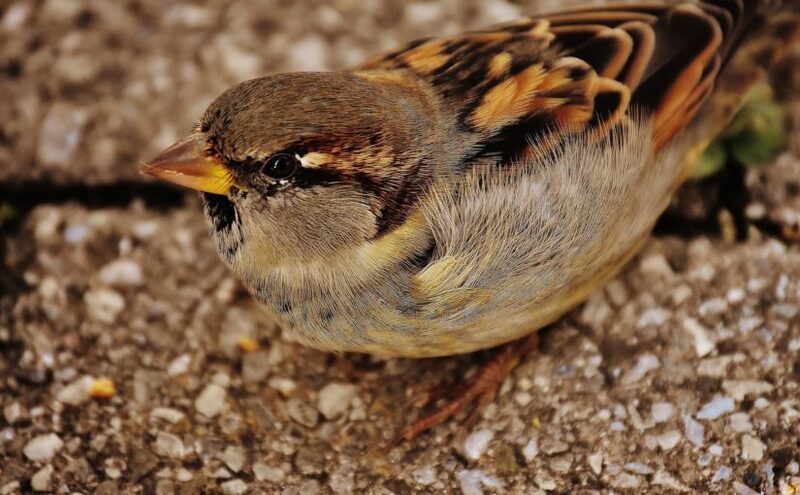 When yard time ended, he gingerly placed his fine feathered friend in the pocket of his jacket. They would have made it too if that bird had just laid low in the pocket for a couple of minutes. When inmates return to their cells after yard time, they go into a small gated area to be handcuffed before entering the prison building again. It’s sort of like a chamber lock system. The inmate stands facing the yard, with his back to the guard. The inmate’s hands are behind his back, where the guard can see them, waiting to be cuffed. The guard who was preparing to cuff Daniel was, rightfully, taken aback when Daniel’s jacket pocket starting jumping around. Daniel is lucky the guy remained calm and didn’t shoot him immediately. Instead he asked Daniel what the deal was and learned about the bird in the pocket. Despite Daniel’s urge to give the bird a good home, the guard told him he couldn’t bring a bird into the prison. Oh well. It was a nice thought. Daniel took the bird out of his pocket and put it on the ground, and “Birdie” walked back toward the yard. Daniel plans to keep an eye out for him, so he can share his lunch. Of course I know trying to rescue a baby bird does not make up for committing murder. I don’t think there is anything Daniel could do that would redeem him in that regard. But I wanted to share this story because it shows the side of Daniel Wozniak most don’t get to see, or don’t believe exists. This is the Daniel I know. This is my friend.